Trinity Designs: Just B for Babies! I just love holding newborn babies, they smell so good and feel so soft and warm. I am always happy to hand them back to Mom though - my baby days are 10 years behind me! LOL! We do often need ideas for Baby cards, though and this card and envelope combo is one that I created several months ago for a Featured Artist segment on my upline's website. It was pretty simple construction, utilizing the 1 1/4" square punch for the patchwork pieces. I attached them first to a piece of Very Vanilla cardstock and then trimmed the edges down a bit to make them even. That 'quilted' piece was then attached to the folded Very Vanilla card base. The buttons are from the Soft Subtles assortment and are attached with a Mini Glue dot. The Key Tag punch created the greeting plate and the ribbon used is the Creamy Caramel gingham. All the edges are sponged with Creamy Caramel ink to give it an antiqued effect. The paper I chose is from the Prints Pack which is a level one hostess gift in this catalog - and it's going bye-bye soon! All the Hostess stamp sets and accessories retire with every catalog. You know the Retiring Stamp Set List comes out THIS Sunday, June 15th! The stamp set I used is here called Just B and it was new to this catalog! 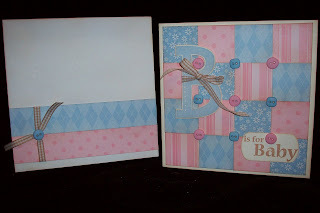 I stamped the large 'B' image in Bashful Blue to match the paper and trimmed it out with my Paper Snips. It's mounted on dimensionals for height. One of the things that Stampin' Up! promised us is that ANY stamp set that was NEW to this current catalog will not be retired for at least a year - so that means we have at least until February of 2009 to get this versatile set. Enjoy the card today stampers - scroll down a few posts to view the winner of my Stamp Camp card leftovers giveaway! Wow Robin, this is just gorgeous! Thanks for posting!